Greetings in Jesus’ wonderful name! It is both a joy and a privilege to share some of my heart and the Word of God with you. As I write this, many hundreds of faces and names come up in my mind, as well as many fond memories of times spent with so many precious saints who are reading this letter. I know most of those receiving this letter, and I consider you my friend. I am committed to stand in truth in order to give you, and each person in my life, the best opportunity to do what is right, and thus draw closer to the Lord Jesus. I would hope that is also your commitment to me. YES-S-S!!! It’s Spring! Finally. OK, if you live in Florida or California or Arizona, you’re saying, “Big deal.” But if you have endured a winter like we have here in Indiana where the ground was white with snow for weeks, the advent of warmer temperatures, green grass, flowers, and leaves is incredibly refreshing. New life or, at least, rejuvenated life, is bursting forth all around us, and it is invigorating and energizing. Springtime means “Easter,” which, despite the pagan roots of that title, should remind Christians to celebrate the resurrection of Jesus Christ. How sad that a recent survey by The Barna Group (a ministry that researches trends in Christianity), showed that only 42% of Americans associate Easter with the resurrection of Jesus Christ. Even as Spring signals the end of Winter and the coming of more light and life, so the glorious resurrection of our Lord signals the transformation from death unto life available to every person who chooses to make him Lord. 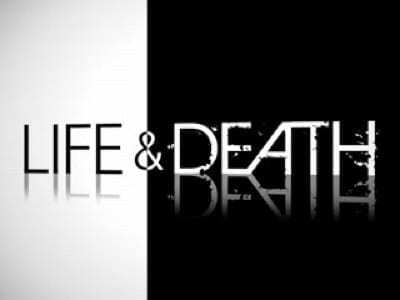 You’ll notice that most folks are going the other way—life unto death. As I write this, my heart aches about the four friends, ages 20 to 83, whom I have lost in the past six weeks. How sad that most people, including most Christians, believe a pagan fable about an “immortal soul.” That lie negates the gruesome reality of death and thereby greatly dilutes the magnificent glory of resurrection life. Think about it. If some incorporeal but conscious part of us (usually called the “soul” or the “spirit”) survives the cessation of our bodily functions, then “death” is not really what every dictionary says it is: “the end, or absence of, life.” If a person does not really cease to exist, it logically follows that resurrection, then, is not that big a deal. What’s the point? Have you ever thought about the contrast between the attitudes of Socrates and Jesus Christ just prior to their respective deaths? Socrates, the Greek philosopher, believed the made-up fallacy of an immortal soul. Before he ceremoniously drank the poison hemlock (do not try this at home), he had a big party with all his friends and lived it up. And I guess he then cavalierly said, “Bottoms up!” And that’s just what happened to him. In stark contrast, Jesus was alone in Gethsemane, and, by his own admission, he was “overwhelmed with sorrow to the point of death” (NIV). The Greek means “crushed with anguish.” Some party, huh? Was the difference in their attitudes due to the fact that Socrates had a better understanding than Jesus about life? No, it was because Jesus had a better understanding than Socrates about death. He knew that it was the enemy of all enemies (1 Cor. 15:26), and that when he took his last breath, he would never live (exist) again if God did not keep His promise and raise him from the dead. Well, there you go. There’s the blueprint for Christianity. I for one do not want any part of such a challenge unless I have proof that there really is life after the death of my self-interests. Thank God that He did keep His Word and raised Jesus from the dead. And thank the Lord Jesus that he poured out the gift of holy spirit into our hearts when you and I made him our Lord. We do have the proof that the life-giving power of God will bring us through the seasons of death in our lives and produce the fruit of true life for us. Praise the Lord for choosing to walk the full length of the valley of the shadow of death and thus guaranteeing that each person who believes in him as Lord will one day rise to everlasting life in a beautiful new body. What a glorious day that will be when we see him, as well as all those we have loved and lost. It really is going to happen, and that will be a party! When he comes for us, everything will be brought to light and there will be true justice for every person who has ever lived. Everyone will get what’s coming to him, both good and bad. I was reading Psalm 31 the other day, and noticed verse 5: “Into your hands I commit my spirit; redeem me, O LORD, the God of truth” (NIV). Jesus quoted the first part of that verse as the final words he spoke, and how significant that he did so in the face of the most egregious injustice ever perpetrated upon any human being. But he knew that the God of truth will one day bring everlasting justice, rewarding all good and punishing all evil. In this insane world, you and I also can, and must, rest in that assurance and continue to do good, especially unto the household of faith.